Graveside Services for Vivian Pitts will be held at Fort Lyon National Cemetery on April 5, 2019 at 1 :00 p.m. with Pastor Mark Cloer officiating. Per Vivian’s request cremation has taken place and there will be no visitation. On March 29, 2019, Vivian Estelle Baker Pitts, loving wife, mother, and grandmother, passed away at the age of 94. Vivian was born on February 24, 1925 in Clinchco, VA, but spent most of her early life in Clintwood, VA. She came to Colorado in October of 1946 for a two week vacation, but decided to stay for a while longer to work at the Ft. Lyon VA hospital, where she was introduced to her future husband, Max Leon Pitts. The two were married on October 5, 1947 and raised two sons, John and Guy, and one daughter, Maxine. 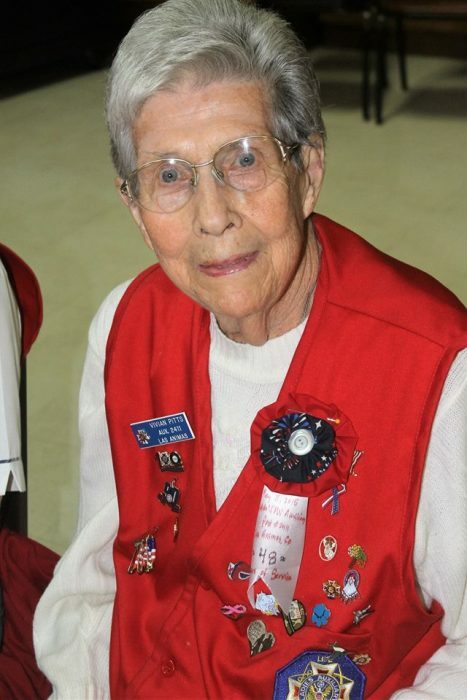 Vivian was a proud, life-long member of the Disabled American Veterans (DAV) Auxiliary and the Veterans of Foreign Wars (VFW) Auxiliary. She was also a member of the Bent County Senior Citizens Club and felt honored to have served as their president for 18 years. Vivian was preceded in death by her brother, Joe Baker; sisters, Josephine Fleming, Naomi Wynn, Billie White; grandson, Scott Ward; great granddaughter, Elizabeth Carpenter; son, John; and husband, Max. She is survived by her daughter, Maxine (David) Carpenter; son, Guy (Sherry) Pitts; daughter-in-law, Mary (John) Pitts; and many beloved grandchildren, great grandchildren, and great great grandchildren. In lieu of flowers, the family requests that memorial contributions be sent to Denver Children’s Hospital, 13123 E 16th Ave., Aurora, CO 80045.